Orphan drugs are named as such because the diseases they are designed to treat affect < 200,000 people in the United States (let’s not argue the number of people afflicted with AIDS for the purposes of this article, okay?) The Orphan Drug Act led to the creation and introduction of valuable new drugs for the treatment of rare diseases like cystic fibrosis and AIDS. The law offers tax incentives, fee waivers and a seven year monopoly on drug sales in an effort to encourage pharmaceutical and biotech companies to develop drugs to treat these rare diseases. Question #1: Do you or someone you know work as a nurse or doctor or work at all in the medical profession? What is critical to acknowledge is that while some drug companies have been accused of charging exorbitantly high prices and making equally exorbitant profits the more significant point, IMHO, is the Orphan Drug Act had a positive impact on the lives of the children and families of those afflicted with these rare diseases. Representatives Sheila Jackson Lee and Gene Green obviously agree as Congressional records reflect their YES vote on H CON RES 147, Commemorating The 20th Anniversary of the Orphan Drug Act and the National Organization for Rare Diseases back in May 2003. Question #2: Do you or someone you know work as a nurse or doctor or work at all in the medical profession AND support Obamacare? Question #3: Did ANY of you who answered YES to question 2 actually READ the damn Obamacare bill before it was passed? We know Nancy Pelosi sure as hell didn’t and it’s clear Sheila Jackson Lee didn’t when she said this law would mean “our children would have more insurance” and BULLIED those of us who opposed the law. It’s great to use Sheila Jackson Lee’s own words against her when she lies, though. On December 9th the NY Times reported this story “House Passes Bill Averting Cut in Medicare Reimbursements” and in paragraph ELEVEN write that the bill also restored the orphan drug discounts lost by the children’s hospitals under Obamacare. 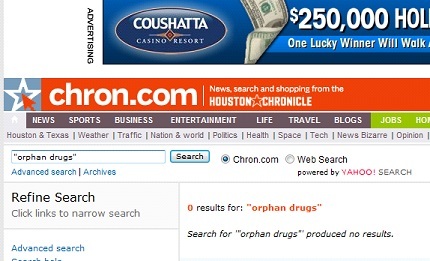 What did the Houston Comical…err Houston Chronicle write about this “reversal”? And I’m not letting Senator John Cornyn or Senator Kay Bailey Hutchison off so easy either. Question #4: Did ANY of you who work in or know someone who works in the medical profession actually VOTE to send Sheila Jackson Lee and Gene Green back to Congress? I’ve got two words for you..Josef Mengele. This bill is a disaster and needs to be repealed. Sheila Jackson Lee and the morons who sent her back to Washington are the true hostage takers and the true discriminators. And speaking of discrimination, what are these same politicians and media outlets reporting on the Black Farmers case known as Pigford? Social Cons vs Fiscal Cons – False Choice?